Post-attack volunteerism: Lasting trend or a blip? Since Sept. 11, Donna Nix has given blood, sorted canned goods at a food bank and made care packages for AIDS patients. Before the terrorist attacks, Nix was content to enjoy the comfort of her living room sofa. But when the unfathomable happened, she – like thousands of Americans – was inspired to join the nation’s ranks of volunteers. “Giving of your time became more important instead of just sitting at home watching TV,” said Nix, a 27-year-old office worker from Hendersonville, a Nashville suburb. “I realized I could be doing something better. In the hours and days after Sept. 11, Americans flooded volunteer agencies and relief organizations with donations and offers to help. Since then, President Bush urged the nation to make the post-attack “culture of service” a lasting part of American life. Bush called for each American to donate 4,000 hours over a lifetime. But while Sept. 11 sparked a tremendous upsurge in volunteerism, it’s not clear “whether that’s been a lasting trend or just a blip,” said Sara Melendez, president and CEO of Independent Sector, a Washington-based coalition of more than 700 charitable groups. So far, it looks more like a blip to Jennifer Gilligan Cole, executive director of Hands On Nashville, an organization that coordinates more than 1,600 volunteers. United Way of America reported a 6 percent rise in volunteers in 2001, and “I’m sure that can be attributed in part to Sept. 11 and renewed community spirit,” said United Way spokeswoman Ann Andrews. But whether that held firm in 2002 won’t be clear for several months, she said. Close to ground zero, interest in volunteering remains high, said Ariel Zwang, executive director of New York Cares, which still advertises recovery-related needs on its Web site. “It’s obviously leveled off since the early months, but what we have now is a level about 25 percent higher than before,” said Zwang, whose organization provided volunteer opportunities for 48,000 New Yorkers last year. “After Sept. 11, I went up to see ground zero and it was really inspiring,” said Harris, who helps at a Police Athletic League community center and visits residents at a senior citizens home. In Tennessee – nicknamed the Volunteer State for furnishing a remarkable number of volunteers in the War of 1812 and the Mexican War – some college students want to keep the patriotism and volunteer spirit alive. Brooks Brown, a 20-year-old student at the University of Tennessee in Knoxville, helped persuade state lawmakers to pass a “Unite Our Cities” resolution. It urges public school systems statewide to create opportunities for students to do volunteer work commemorating Sept. 11. “We want to show parents and teachers and kids coming up behind us that we are concerned about our community and the future,” Brown said. In the wake of the terrorist attacks, Americans also showed their concern by giving blood. Nationally, more than 276,000 people gave blood for the first time between Sept. 11 and Oct. 1, the Red Cross reported. However, only about 20 percent have returned to give blood a second time. The sun rose. Tennesseans showered and shaved and scanned the morning headlines. The second Tuesday in September began as any other day. Brentwood resident Nancy Tolbert, mother of a Navy intelligence officer stationed at the Pentagon, prepared to move her elderly mom into an assisted living center. Nashville teacher Barry Sprouse, a retired Army lieutenant colonel, headed to his ROTC class at Hunters Lane High School. Jim Sohr and John Liederbach, Franklin health care consultants in New York on business, fretted over an important client canceling a meeting at the World Trade Center. 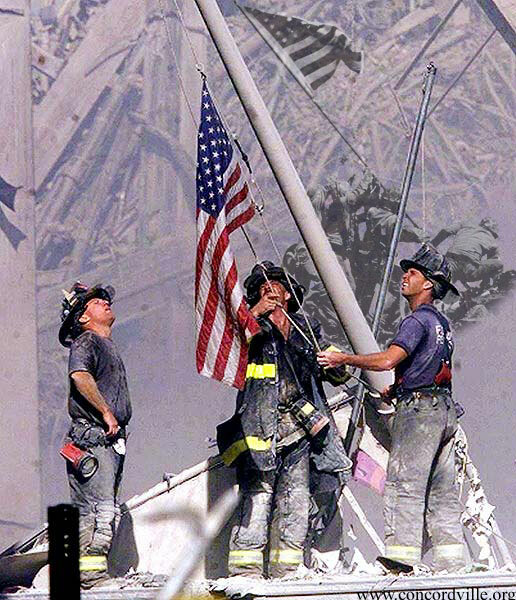 Sept. 11, 2001 – just an ordinary day – until the unthinkable happened. Nancy Tolbert got a call that morning from her daughter-in-law Shari Tolbert, wife of Navy Lt. Cmdr. Vince Tolbert. “She had called me to tell me what a little imp our grandson had become,” Nancy recalled. At the time, little Anthony was a year old. Nancy and her husband, United Airlines Capt. Butch Tolbert, had visited their oldest son and his family in Washington the month before. Besides Anthony, they had enjoyed seeing granddaughters Amanda, then 9, and Brittany, 7. Vince, 38, had taken his dad – a retired Navy pilot who flew more than 200 combat missions in Vietnam – on a tour of his Pentagon office. Born in Millington, Vince grew up in central California and became a star high school football player. He played running back and defensive end for Fresno State and had a chance to try out for the Dallas Cowboys. Instead, he pursued his dream of becoming a Navy pilot, just like his dad. But when a knee injury derailed his flying career, he put his degree in criminology to use and landed a job with Navy intelligence. At the Pentagon, he prepared classified reports for admirals who briefed Defense Secretary Donald Rumsfeld. While driving his parents to the airport after their visit, the subject of terrorist Osama bin Laden came up. The morning of Sept. 11, Nancy and Shari were still on the phone when the first horrible images of the World Trade Center flashed on the TV screen. A little later, Shari called back. “Oh, my God, it’s the Pentagon,” one of them said as they kept watching. They hung up and decided to communicate by e-mail, in case Vince tried to call. By that afternoon, Shari still hadn’t heard from him. “Knowing the type person my husband is, he would have found a way to call,” she told her mother-in-law. Butch Tolbert called from San Francisco after a flight from Japan. He wanted to know if Nancy had heard from Vince. By then, Shari had learned that Navy officials were headed to her house. Butch and Nancy both knew what that meant. “Years ago, during Vietnam, if you saw the official car on your street, your heart stopped,” Nancy said. Vince’s desk was near where American Airlines Flight 77 struck that morning, killing 125 at the Pentagon and 64 aboard the plane. Vince’s body was found six days after the attack. Ten days after that, he was laid to rest in Arlington National Cemetery. “Turn the TV on,” a fellow teacher grimly told Barry Sprouse as he taught a morning class. Sprouse, a retired Army officer, couldn’t believe what he saw. The smoke. The chaos. The rescue workers. After the attacks, Tennesseans inundated the American Red Cross to donate blood, to volunteer to drive to New York, to help however they could. Sprouse was one of them. After an accelerated training course, he spent 21 days in New York, helping coordinate the delivery of food, water, medicine and supplies. “Television didn’t do justice to what I saw and what I felt and the looks of the people there,” he said. The meeting was to start at 9 a.m. The first hijacked passenger jet crashed into the World Trade Center’s north tower at 8:45. At 9:03, a second hijacked airliner crashed into the south tower and exploded. Jim Sohr and John Liederbach were supposed to be on the 32nd floor of the south tower. But when the executives from Franklin-based AIM HealthCare Services Inc. arrived in New York the night before, a voice mail was waiting. Something had come up. The meeting with an important client needed rescheduling. “We were still scrambling, trying to make it happen, even that morning,” Sohr said. Liederbach walked from his hotel near the Empire State Building to a corner Walgreen’s to buy orange juice. Suddenly, a woman ran in screaming. “The World Trade Center’s been hit!” she said. Before long, his cell phone rang. It was his wife, Nan, mother of their four children, calling to make sure he was safe. Nearly an hour passed before Sohr’s executive assistant reached him and confirmed he was OK. The businessmen spent the rest of the day going from hospital to hospital, trying to help. “You see all the orderlies and physicians and attendants with the gurneys and the oxygen, all waiting for this influx of patients, and everybody really standing around with nothing to do,” Sohr said. The day’s eerie silence – pierced only by an occasional ambulance siren or an F-16 fighter jet – struck Liederbach and Sohr, who make frequent business trips to normally noisy New York. And Sohr couldn’t help but notice people’s shoes. “The closer they were to this thing, the dirtier their shoes got,” he said. “You’d see people with sort of normal shoes, then those whose shoes were dirty and dusty, and then you started seeing people covered head to toe in dust. To Liederbach, the people looked like West Virginia coal miners – only with white dust instead of black coal. Their lives were changed, albeit in different ways. Nancy Tolbert lost a son. Her daughter-in-law lost a husband. Her grandchildren lost a father. Still, Tolbert said she doesn’t hate Osama bin Laden. A year later, Tolbert struggles to grasp the enormity of her loss. The wounds still feel so fresh. She dabbed her eyes frequently with a tissue as she discussed her plans to attend an anniversary memorial service at Arlington National Cemetery. “A lot of condolences are still coming in and I haven’t responded to all of them,” she said. “I just don’t have the energy. Sprouse didn’t lose a family member, but he was touched nonetheless. After he returned home, his wife inadvertently tuned the television to a victim’s funeral. As bagpipes played “Amazing Grace,” Sprouse had to leave the room. He won’t watch any Sept. 11 remembrance ceremonies. For Sohr and Liederbach, Sept. 11 will provide a reminder of life’s fortune and fragility. Since Sept. 11, he can’t help but hug his three daughters a little tighter. “I guess in a weird way, it made me realize how out of control we are as people and how God’s in control,” Liederbach said. “It definitely helped me just reevaluate priorities. Often, that means using the “Jaws of Life,” a hydraulic extrication tool, to free somebody from a car wreck, or taking gasoline to a person whose motorboat has run empty. On Sept. 11, however, it meant calling banks and car dealerships, Wal-Mart and Kroger, to collect money for an emergency trip to New York. “I mean, I broke out the yellow pages,” said Charles Reeves, 20, who on that day was manning the Smyrna rescue station – a dark, wood-paneled office where fluorescent lights flicker overhead and radio static crackles in the background. Reeves watched on the station’s wooden, 1970s-era color television as the second plane crashed into the World Trade Center. “They’re going to need help,” he thought. Six unpaid volunteers in this small town 20 miles south of Nashville decided to give it to them. They just needed a little assistance with gas money and supplies. Almost immediately, the donations flowed in. The Leanna Church of Christ, Team Chevrolet, NBC Bank – all wrote checks for hundreds of dollars. Others did, too. At Wal-Mart, the rescue workers filled carts with donated batteries, flashlights and supplies. “I was driving a 1-ton Dooley, and it was cram-packed full of equipment,” Capt. Tommy Parham, a 39-year-old plant worker, said of the heavy-duty pickup truck he took to New York. Unsure where they’d sleep or what they’d eat, the Smyrna men packed tents, sleeping bags, lanterns, canned ravioli, tuna and soup. Much to their surprise, though, cheering crowds welcomed them to New York. People stuffed sandwiches, bottled water, even changes of socks in the windows of their truck. They found a hotel room in Newark, N.J.
At the volunteer site where the Smyrna rescuers checked in, a Manhattan fire chief greeted them. “We’re here to help,” Parham said. “Who you with?” the chief asked. Pulling up to ground zero, the Tennesseans were struck by the sheer number of bodies – and the “smell of death,” as Reeves put it. “It was just indescribable,” he said. The rescuers spent their days filling 5-gallon buckets with debris and passing them down the line. At times, they waited for hours to relieve other crews. But they didn’t mind. “We just did whatever needed to be done,” Parham said. The Smyrna men befriended two Ohio volunteer firefighters who had driven to New York in a small rental car. The men were sleeping in the car with their fire gear – until the Tennesseans offered to share their room. One of the men, a preacher, used humor to relieve everyone’s tensions. The memories of those five days won’t soon fade. A year later, the rescue station still looks much the same, except for two $1,000 recliners that Regal Furniture donated after the volunteers’ return. Aside from Reeves, the squad has lost another volunteer, Charles “Rowdy” Matheson, who decided to take his service a step further. Matheson, 20, joined the U.S. Army, and now serves as a military policeman at Fort Hood in Texas. “I guess you could say it personally ticked him off enough where he wanted to go find Osama,” Reeves said.